Nature Walks: in Privacy & Peace, among the little Stone-Walled Fields of our Traditional Gardens. Paint, Write, Photograph .. Inspiration all around you! Walks: Beach, Coastal, Mountain, Boglands. Hiking: Direct Access to Errisbeg Mountain ‘the Best Short Climb in Ireland’ with Spectacular Views. Beaches: Gurteen & Dog’s Bay. Wonderful Walks; Swimming; Rare Sands; Spectacular Views. Island Visits: Inishnee via Bridge. Inishlackan via Boat. Cycling: Coastal; Island; The Bog Road – Magic. Irish Nights – Traditional Song/Music/Dance. 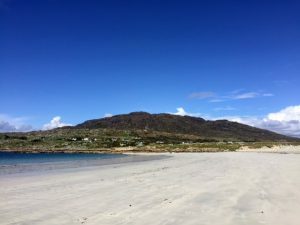 Errisbeg, Roundstone & Environs has long inspired and is renowned among Artists, Writers, Nature Lovers. Walk in the footsteps of the Artist J. B. Yeats, Playwright J. M. Synge, and Botanist R. L. Praegar, among others. Roundstone – a picturesque 19th Century Coastal Village (2 min drive/25 min Walk) with a lovely Harbour and The 12 Bens as a back-drop. Location for several movies – including ‘The Mackintosh Man’, ‘Into the West’ & more recently ‘The Matchmaker’, you’ll find an excellent variety of Restaurants (including Seafood), Pubs, Galleries, as well as Food stores, a Gas Station and an Internet Cafe. Renowned Cartographer, Environmentalist & Writer Tim Robinson has his Folding Landscapes located in Roundstone village. No visit to the area is complete without exploring the local Craft Centre – where you’ll see local Craftspeople at work – Ceramics, Jewellery, etc. You’ll also find Roundstone Music & Craft Shop – Bodhráns, Tin Whistles, CDs, Books, Coffee & Craft Shop – where Malachy Kearns makes the famous Drums for Riverdance. Roundstone Bog – (10 min) – Unique Blanket Bog; Rare Flora/Fauna. Golf – 27 Links Course @ Ballyconneely (25 mins): 18 Hole Pitch & Putt @ Recess (20 mins). Horseback Riding – @ Cleggan (30 mins). Kylemore Abbey; Connemara National Park; (35 mins). Killary Fjord – Leenane (35 mins) – Sea Cruise; Sheep Museum; Ashleagh Falls. Coastal Drives – miles of scenic Coastal drives – Mannin, Sky Road, Renvyle Peninsula. The Bog Road – Enchanting Route! Hiking – The 12 Bens. Inishboffin – Day Trips by Ferry (35 mins). Aran Islands – Day Trips by Ferry (40 mins). Cong – Cross. Location for ‘The Quiet Man’ Movie. Galway City (1 hour) – Theatres, Museums, Shops, including Kenny’s Bookstore.